It’s official. Last week we predicted a surge of at least 125% +/- based on the sales we were studying for single family homes in Lee County. Official numbers were just posted, and it looks like it was on the + side of our prediction. Sales came in at 133% over last year’s numbers for single family homes, and prices were up a healthy 3.82% over last month, marking the 5th straight monthly gain. Median single family sales prices now stand at $95,100, up from a recent low of $87,900 set back in June. As you can see, the market has turned around since June and has steadily increased in price, and has set records in sales volume as well. This isn’t news to News Press readers or listeners of the Future of Real Estate Radio Show, nor to agents active in the business. For months agents have been telling buyers the market is one the move, and the time to buy is now, and buyers for the most part have gotten the message. It’s always fun when an out of the area buyer comes down and wants to make offers 20% below asking price because that’s what you do someplace else. Buyers seek the assistance of an agent and it is the agent’s responsibility to educate buyers and sellers to actual market conditions. Most agents I speak with do a very good job at this. When you need an attorney typically you let them represent you and you follow their advice. Same goes with a doctor, typically you tell the doctor how you’re feeling and answer the questions and the doctor makes a recommendation for you based upon your needs. So why would an agent not offer the same advice to an out of town buyer or seller? Like I said, most agents do. Many times we’ll receive multiple offers on a property, and most are at or above asking price, especially when the property is a good buy. Occasionally I’ll receive one that is 10-20% below asking price when I’m sitting with other offers above asking price. I’ll ask the agent working with the buyer what was it that caused the buyer to offer at that price. Sometimes we’ll get that’s all they’re qualified for, or that’s all they want to go or feel it is worth. Sometimes the agent replies the buyer just wants to buy it as cheap as they can. Who wouldn’t want to buy it as cheap as they can, but the buyer’s got to get in the game to buy it at all. We’ve told people before, if you’re going to steal, don’t do it in slow motion. If you’re looking at a bank owned bargain, and it’s a steal, go get it. Chances are others are looking for the same thing. SW Florida is experiencing record sales right now, and if it’s a bargain, you know there will be multiple offers. Why try to get an additional 10-20% off when it’s already a bargain? I then ask the agent why they haven’t told their buyer about the market, right after I inform them we have multiple offers. Sometimes I hear “I know, I know, I’ve tried to tell them but they won’t listen.” Other times I hear I don’t want them to work with another agent, so I just do what they tell me. Both instances are signs of lack of confidence in the agent. It’s truly an agent’s job to educate. Buyers and sellers will thank you for it, because if you don’t do it, you’re just wasting their time and yours. After losing out on about 7 offers, buyers become frustrated. Agents become frustrated with buyers after about 2-3 offers if the buyer isn’t listening. So why not just cut to the chase and end it upfront. I know, there will always be another agent who will do what the client says, but if the client won’t listen to you, can you really help them? It’s one thing to work with a buyer who is doing everything they can to buy a home. We have customers putting in offers above full price at the max of what they can afford and still losing out. That’s quite different than a buyer who is low balling out of ignorance. Buyers and sellers should listen to their agent, and agents shouldn’t be afraid to counsel and give the cold hard truth to their customers. Market forces eventually win out in the end anyway, so getting there as quickly as possible is the best way to avoid frustrations, and get you in your first choice property instead of your 8th choice. In a stagnant market your choices don’t change often, but this market is anything but stagnant and the market is on the move. It pays to study the market and get ahead of the market. Sellers never want to chase the market down, and buyers hate to chase it up. 2010 will be an interesting year. It’s always fun to cover a changing story, and this story is changing. If you’re not buying or selling, it will be fun to watch. If you are buying or selling, it’s time to do your homework. First, we’ll start with the good news. 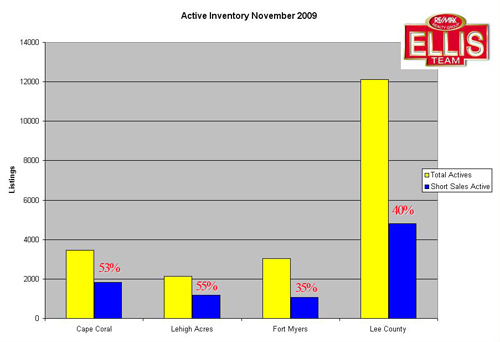 Official real estate sales numbers for Lee County for November 2009 won’t be released until December 22. 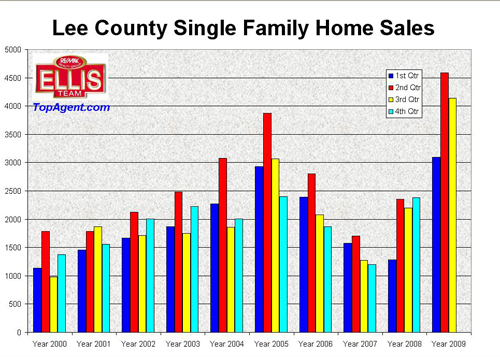 Last year November single family home sales totaled 600 in the Lee County area. This year we expect somewhere around 1,355 total single family home sales +/-. Assuming the 1,355 is anywhere close to accurate, those numbers would be an increase of 125.83% over last year, which is pretty remarkable. We’re sure the headlines will tout this feat. 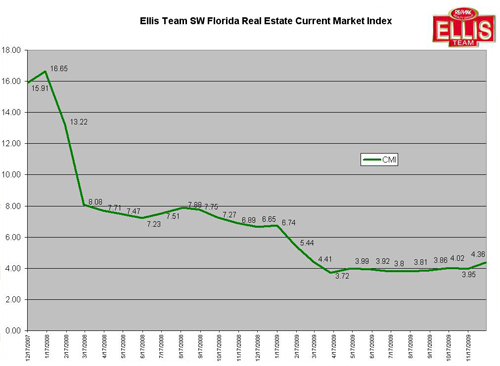 As many of our readers know, the Ellis Team developed the SW Florida Real Estate Current Market Index many years ago which has accurately predicted the forward direction of the local real estate market. This month we spotted a new trend. The Index spiked up a bit to 4.36, close to what it was back in March. A falling Index number is a sign the market is heating up, and a rising number indicates the market is cooling down. 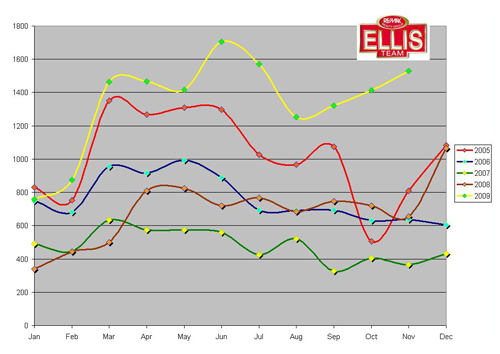 As you can see, the graph was heading down which led our market to record sales numbers all year. This month is the first month we’ve witnessed a spike in a long time, which could indicate December and January sales may fall from August and September levels. We will want to keep our eye on this Index in the coming months to see if it is a continuing trend. It does make sense though as the Homebuyer Tax Credit was due to expire at the end of November. This credit was just recently extended, so we’ll have to see if this affects future home sales going forward. We’ve also witnessed an increase in listing inventory the last three months. Pending sales are down over 100 units this month. The pending sales drop can be attributed to lag time in the Homebuyer Tax Credit, and diminishing listings in the lower price ranges. We’ve begun to see slightly higher priced listings coming to the market. FNMA has begun listing more properties as foreclosures, and the banks we work with are bringing new inventory to the market now as well. These foreclosure listings are a result of foreclosures that began 6-9 months ago. New foreclosure filings are trending down, which is good news for the market 6 months from now. We believe this season is going to be good, as visitors recognize this may be the last season to fully capitalize on our great bargains in SW Florida. It will be interesting to see just how much inventory we can draw down through the end of March, as well as through July when the new Homebuyer Tax Credit expires. It’s not surprising that home sales trailed off just a little bit as they typically do this time of year. It’s actually been a little bit surprising home sales have been as strong as they have, but of course investors have been swallowing up properties at great prices, and first time home buyers who were employed and qualified for a mortgage found the tax credit too good to pass up. Even with these record sales, we’ve still added to overall inventory the last 3 months. We’re going to want to keep our eye on that. We’ve also reported that we feel there is pent-up supply, which is people who want to sell, but just cannot at these low prices. It’s still very difficult to fully assess this market, as there are many hidden variables. The Treasury department has issued new guidance in the sale of short sales. Details are forthcoming, but this should be a roadmap for banks to follow to make the short sale process quicker and a little less painful. You’ll still need a short sale expert as many of details haven’t gone away, but the process is being streamlined and unified so no matter which bank is involved the process would stay the same. Keep in mind, this is government, and most of their past efforts to modify mortgages and streamline have failed, so we’ll see if this is any different. Bottom line is we have a hot market, and visitors have shown interest and are buying. It’s also the end of the year when sales fall, and they’ve remained very strong. We have seen an uptick in listings and a fall-off in pending sales in recent months, and this could all be related to the supposed home buyer tax credit expiration in November. We’re just saying we’ve spotted a slight trend in the numbers and it’s something to keep our eyes on. We still expect big numbers on Tuesday when official sales numbers are reported, and we expect healthy sales all season. Stay tuned, as we’ll be tracking. We hear a lot about the economy and what Holiday sales will mean to retailers. Traditionally, Christmas sales are approximately 40% of a retailer’s year, and in some cases even more. Makes you wonder how they stay open the other 11 months of the year. A lot of people also think Season makes the local real estate market. This may be somewhat true for condo sales, but historically single family home sales are fairly steady, with the 2nd and 3rd quarters usually accumulating the highest sales. Season usually brings a lot of visitors to the area, and of course when they experience our awesome weather in January and February, they dream about buying in the future, so they call and ask to look at homes, many times a few hours before their plane departs for back home. We think this season is going to be different. Buyers from up North have already started coming down looking to pick up their dream home. They know that Florida is on sale right now, and the chance of getting a 2nd home or retirement home next year or the year after at these prices is slim. Buyers are actually afraid they’re going to miss the bottom, and they know this may be their last season to fully capitalize. Foreclosures are trending down right now, and median prices are trending up. Home sales set a record in every quarter so far in 2009, and nearly set one in the 4th quarter in 2008. When we say set records, we mean they posted higher sales than even the peak of the market in 2005, only at much more affordable prices. The national media has reported the low prices we have in Florida, and we’ve seen an influx of buyers from Canada, Europe, and all over the U.S. The first time home buyer tax credit has been a big help to first time home buyers up until this point, and the recently expanded home buyer tax credit for existing owners may help going forward to for sales that close by July 1 and are under contract by April 30, 2010. Median sales prices currently stand at $91,600, and that is after its 4th straight monthly gain. To put this in perspective, in December of 2005 the median sales price was $322,300. Median prices today are roughly 28% of what they were only 4 short years ago. In other words, median home prices were almost 4 times higher than today. That is a sale no matter what store you’re at. This sale we’re experiencing has not gone unnoticed by buyers. We’ve gotten some calls recently from sellers who live up North and want to sell because they see stories about property moving again in Florida. They didn’t like the prices last year, so they figure this year must be better. It must be nice to live somewhere else and not have to live what we’ve been going through here locally. They are usually surprised when we tell them what units are going for in the neighborhood. So many will wait to sell next year at higher prices, and they will probably get a higher price next year as buyers soak up all the bargains they can en masse. I’m not sure prices are going back up to December 2005 levels, but they are slowly going up. We have pent-up demand from buyers and its being unleashed now, at least while the bargains are out. I think we have pent-up supply from sellers who would like to sell but can’t today, and that’s another reason why we don’t see prices quadrupling. This supply will eventually come to the market as prices rise and foreclosure inventory dwindles down the road. The economy will have to make a comeback too, and jobs will be required to complete this cycle. In the meantime, get ready for a strong home buying season. Agents and title companies will be busy this season. Mortgage originators will be too except many of these sales will be cash. 2009 has been busy already. As you can see, it’s been record setting. We’ve been so busy we’re hiring agents to join our team. People think Season is the only time homes sell in Florida, and as you can tell from the chart, 2nd and 3rd qtrs are generally the prime time for home sales. Season 2010 might change that and make a run at big numbers if the inventory remains there to be sold. The buyers are there. Here’s to a happy season to all. Buyers, better get your bargains now, because next year they may not be at today’s sale prices. As you can see from the enclosed chart, short sale listings account for 53% of all active Cape Coral listings, 55% of Lehigh Acres listings, 35% of Fort Myers listings, and 40% of Lee County listings. While foreclosures account for more of the completed sales in Lee County, there are far less of them listed and they tend to go very fast. Short sales on the other hand tend to take much longer, and their sale is not certain at all. So we want to inform people of some of the things they should know about short sales. A trend we see developing is many banks are requiring sellers to participate in the loss and pay money at closing, or agree to a promissory note that the bank will collect on. Sellers should be very cautious not to list the property too low or the bank will reject the offer outright if it’s not within reasonable value, and they are coming back on the sellers regardless of whether it’s a homesteaded property or investment property. Banks may not file a 1099 to the IRS on a homesteaded property, but they are in many cases on investment properties. The forgiven debt has always been treated as income to the IRS, so if you take a loss on an investment property, prepare to pay taxes on the forgiven debt regardless of your ability to repay. This is another reason why selecting an agent with experience in short sales is critical. Not only must the agent understand what the banks want to see in the total package, they must also understand what the banks are doing today and their implications to their clients. Agents are not tax advisors; however agents can pass along valuable experience before you go through such an ordeal. Buyers are very wary of buying short sales, as are buyer agents. Buyer agents typically only show listed short sale properties when they know the listing agent has a firm grasp on All the details needed to get the short sale through. A listing agent should also make sure there is a title search done. If you miss a potential lien on property and do not list it on the estimated net sheet the bank requires, it will not be part of the accepted short sale and the seller or buyer must pay the difference at closing. It definitely pays to know all the back fees and penalties from HOA’s, utility companies, etc. upfront versus finding out later on and having the short sale deal blowup at closing. You’ll usually want an estoppel letter from the homeowners association showing all back fees, because in a short sale they will need to be paid off. In a foreclosure the HOA may only be entitled to recover 6 months of back fees. This is one reason HOA’s should be more cooperative in providing this data. Many homeowners associations don’t realize their management companies are charging large sums simply to provide an official amount the owner may owe. We also recommend sellers pay their HOA fee even if they are delinquent on their mortgage. Time is valuable in a short sale, and the HOA could actually file foreclosure papers much sooner than the bank might. When the clock is up, the short sale is dead. I can’t tell you how many homes we’ve seen listed as a foreclosure after the banks supposedly agreed to a short sale. The bank(s) should only see one accepted offer from a seller. If a bank sees multiple offers it gums up the works, and sometimes leads the bank to believe it is a Hot property and should sell for more. Nevertheless, it increases the time it takes the bank to respond as it is much more work, and we should do nothing to increase that time. Furthermore, there is a legal risk by accepting more than one offer. The offer is between buyer and seller. The bank cannot agree to a short sale unless seller agrees with a buyer. The bank can only tell you what they’ll do if you have a sale. A seller could have legal problems if more than one buyer believes they have a valid contract with the seller. We also don’t believe in sending in fake contracts to get the ball rolling with the bank. When banks discover this tactic they are less likely to work with you. Additionally, there is no such thing as an accepted short sale price. If you lose a deal, typically you have to start all over and the terms usually change. There is a test program that is an exception to this rule on HUD properties, but that price is set upfront and has nothing to do with previously accepted contracts. There are many other things a buyer and seller should know. To view a video segment on HOA’s and management companies, visit segment 2 of last week’s Future of Real Estate Show. http://bit.ly/8pfMMf or you can visit http://www.youtube.com/brettellisfl for many real estate related videos.